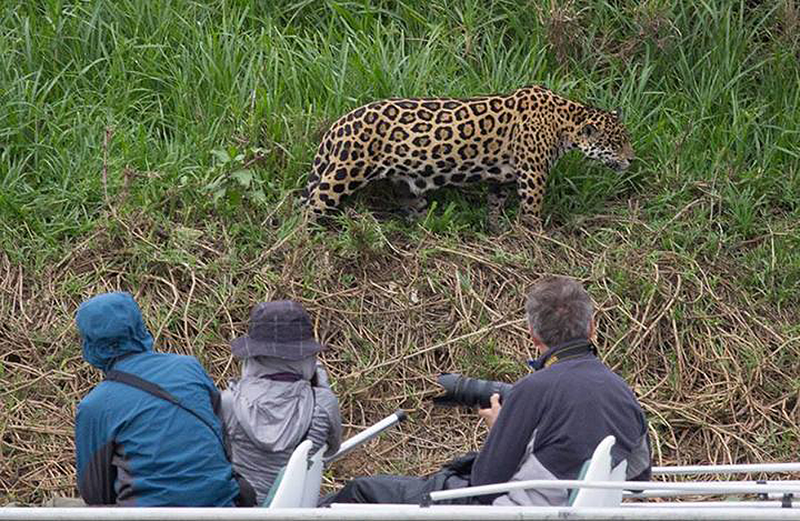 Observing a Jaguar from a search boat, Pantanal, Brazil. Because of the unique location of the Jaguar Flotel in the world’s Jaguar epicenter, we wake up and go to sleep in the middle of the cats (and lunch there, and snooze after lunch) – we are where the action is 24/7, so you get to the cats one to two hours before the competitors and can stay one to two hours later, maximizing your time for spotting Jaguars. Our Jaguar Flotel is anchored next to a forest full of birds and mammals, and is low impact in every way. 24-hour electricity is produced by off-site generators in order to eliminate vibrations and noise in your room, permitting you to hear birds, crickets and large mammals. The air conditioners also are located off site, sending cool air into your room silently. Free WiFi Internet is available throughout the SouthWild Pantanal Lodge and the Jaguar Flotel. We are the only operation with a full-time biologist on staff to coordinate the data collection and give lectures about our Jaguar research and monitoring. We carry out scientific research on the cats by mapping which cats live where and by building up a profile of their use of time (an “ethogram”). No other operator has that information or lectures. Our highly-experienced boat drivers have more contact time with wild Jaguars than any other humans in the history of the world (over 3,000 hours in the case of our top drivers). Thus, our boat drivers are the best in the business in terms of predicting Jaguar movements and behavior. Our boat drivers’ deep experience results in our guests being perfectly-positioned to take prize-winning photos of explosive Jaguar behavior that is all over in a split second. In particular, we have tested all speeds and all distances from the riverbank and know which speeds and distances from the bank produce the best results in Jaguar sighting. Some of our competitors go much too fast and miss a lot of cats – and also erode the riveranks with their big waves. We have a powerful VHF radio system linking all of our boats. A key feature of this radio system is that our command post is on the floating hotel, which means that it is centrally-located for keeping excellent communication flowing about the latest Jaguar sightings. Further, we are the only company that guarantees a minimum of three radio-equipped boats reporting from the various river channels during most of the day. Even when there are few or even two people at our Jaguar Flotel, we put out scout boats with radios to find more cats. To further enhance the sightings, we keep close track of which cats are active where and doing what, and we go back there the next day. We even serve full meals in front of the Jaguar and will never take you from a sitting Jaguar unless you vote to leave (we will take people away one by one for a bathroom break and then return them). Our boats are Jaguar-optimized and photo-optimized. We are the only operation with purpose-built Jaguar-watching boats. One key advantage of our Jaguar boats is that guests have individual sun umbrellas that can be set into a special slot by each seat and angled toward the sun. These 2-meter-wide umbrellas are the ideal way to provide shade. We only put up the umbrellas on a seat by seat basis upon request because photographers usually do not want them, as they can get in the way of serious photography. With the individual umbrellas, we avoid the multiple upright poles on the sides of the boat that are used to support the sun canopies on all of the other boats (which are actually designed for sport fishing). Anyway, those canopies are too low to permit guests to stand up, and they protect guests only a fraction of the time. Further, our Jaguar boats are all designed to have the boat driver in the back (hence out of the photo frame) and to have all passenger seats distant from the outboard motor. A $1,000 guarantee that you will see a Jaguar, which no one else offers.